Al Rayyan Doha (D1) strengthened their roster with addition of 20-year old naturalized Bosnian center Meho Haracic (213-104kg-98). It is actually his comeback to Doha as he has played here before. Haracic started the season at BK Jekabpils in Latvian LatEstBL. In 9 games he recorded 4.1ppg and 1.2rpg this season. 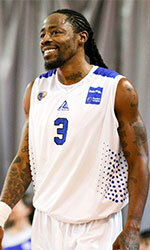 The last season Haracic played at Al Rayyan where in 13 D1 games he averaged 7.4ppg, 5.3rpg and 1.5apg. Haracic's team made it to the Qatari Cup final in 2017. He has played also professionally in Bosnia (Iskra Bugojno).